Linz 2009 European Capital of Culture - Preliminary Program. The run-up to Linz09’s programme was off to a headstart in 2006 with a clutch of small-scale projects such as KOPFSTAND, a series of discussions on a wide range of topics relevant to the Culture Capital, featuring panel members from abroad, and SEITENSPRÜNGE, which assessed existing formats and events in the light of their potential roles in the context of Linz09. The question “Is Linz beautiful?” was designed to stimulate a debate on the city and its aesthetically relevant properties. 2007 saw the realisation of the first group of large-scale seminal projects. The LINZ EUROPA TOUR, a one-of-a-kind trip that caused quite a splash Europe-wide, transported the musician Hubert von Goisern as the Culture Capital’s ambassador from Linz down the Danube to the Black Sea and, on the second leg in 2008, up to the North Sea. 50 concerts with local musicians followed the musical flotilla’s landfalls; the media obliged, took note and spread the word on Linz’s status as European Capital of Culture far beyond Austria’s borders. This made possible external communication via programme content instead of through large-scale publicity campaigns. 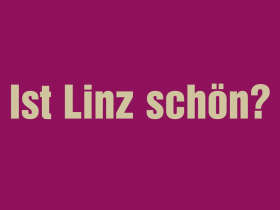 The exhibition LINZ TEXAS fulfilled the same function in Vienna, Graz and Berlin. Showcasing the city and its qualities, it presented a comparison between Linz and other cities not without a lighthanded, ironical, tongue-in-cheek touch. For Linzers the Culture Capital was gradually assuming visible reality in 2007 and 2008 in the first two parts of the trilogy KUNST IN DIE STADT! !, [Art into the City!! ], for which Linz09 collaborated with OK Offenes Kulturhaus Upper Austria; Part 3, HÖHENRAUSCH, was the superlative conclusion in 2009. The venues for the early parts were shops, shop windows and facades in 2007, followed in 2008 by subterranean spaces and tunnels, some of which were virtually unknown to the majority of Linzers. The two exhibitions were designed to increase a sense of anticipation in the local population and to give a foretaste of what was to come in 2009: new venues, new perspectives, unexpected alliances, expeditions to unfamiliar places in the city, top quality local and regional art and a plethora of surprises. The much discussed exhibition “KULTURHAUPTSTADT DES FÜHRERS” at the Schlossmuseum and the exhibition POLITISCHE SKULPTUR at the Landesgalerie, both centring on issues of contemporary history, opened already in autumn 2008. The decision to preempt the start of Culture Capital Year proper with these exhibitions proved right for two reasons: by addressing the thorny aspects of the city’s history in the intended, necessary manner straightaway, they ensured that most of the storm blew over in 2008; when the time came for the inauguration of the European Capital of Culture, the shadows of the past were absent from the ceremony. The exhibitions also garnered additional attention for the Culture Capital Linz. The resonance in the international media was very strong and – with some exceptions particularly in the anglophone yellow press – predominantly positive, the general consensus being that Linz did not fight shy of tackling this difficult chapter of its history in a straighforward manner. Advent 2008 was marked by more and more projects going on stream. TURMEREMIT [The Hermit in the Tower] and TURMMUSIK [Tower Music] took their cue from the first Sunday in Advent; the annual Advent Calendar in the old part of the city displayed cartoons; a fifth candle on the Advent wreath was another unusual feature; a high-profile campaign organised by art galleries in Linz and Upper Austria promoted works of art as potential Christmas presents, and the Theater des Kindes turned itself into a living Advent Calendar and opened a new window every night.